The bottled water industry has convinced many American that their tap water is unsafe. In some situations, like drinking unfiltered surface water, it is safer, but most people live in cities and get treated water from their tap. The rage over Bisphenol-A has resulted in BPA being a common word and clearly declared on labels of products that are BPA-free. Yes, BPA is a concern, but it is not the only chemical in plastic water bottles we need to be concerned about. 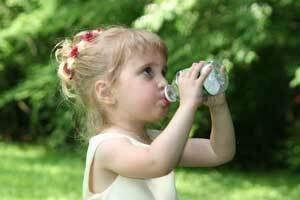 Specifically, scientist recently found 24,520 hormone disrupting chemicals in bottled water. German researchers have just published a study in the respected journal PLoS One finding nearly 25,000 chemicals in bottled water. And some of those chemicals act like potent pharmaceuticals in your body. The study’s authors purchased 18 different samples of commercially sold bottled water from France, Italy, and Germany and, using various methods of chemical analysis, tested the water for its ability to interfere with the body’s estrogen and androgen (testosterone and other male reproductive hormone) receptors. They threw in a sample of tap water to act as a sort of ringer. The majority of bottled waters tested interfered with both kinds of hormone receptors to some degree, the researchers wrote; amounts as little as 0.1 ounces inhibited estrogenic activity by 60 percent and androgenic activity by 90 percent. The latter, the researchers wrote, is equivalent to the hormonal activity of the drug flutamide, a hormonal drug commonly prescribed to men suffering from prostate cancer. The tap water didn’t exhibit any estrogenic or androgenic activity. For the second part of the study, the scientists were trying to learn which chemicals were causing the interference with reproductive hormones. So they used another form of chemical detection and discovered the water contained 24,520 different chemicals. The most hormonally active belonged to classes of chemicals called maleates and fumarates, which are used to manufacture the form of plastic resins used in water bottles. They can also appear as contaminants of other plastic chemicals. I have bought bottled water before when I did not have water from my home. For some reason, just filling up my bottle in a bathroom tap scares me mainly because of germs. In fact, I bought some today for my mother as there is bacteria in our creek water, and we are in the process of buying a filtrations system. This new research will make me think twice before purchasing bottled water again. Edit photos using Fotor! Fotor offers free online photo editor with cool effects,text, photo frames and photo cards. Oh My! After reading your post, I am feeling uneasy about my water choice. I have been a fan of bottled water for many years. I thought they are safe and I really like the taste of purified water. Is this ONE study claiming that the bottled water containing this many hormone disrupting chemicals or are there many more? What I want to know is, is this a valid and tested claim?